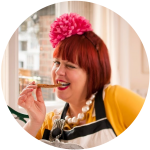 It’s wild garlic season so I’m threading it through all my recipes right now. Ramps tend to be mentioned on American food sites; while similar it is more like a baby leek or spring onion. Wild garlic is just leaves and flowers. Everybody thinks bread and pizza making is so hard but it really isn’t. This recipe couldn’t be easier. Mix, leave for an hour, make balls, fold in ‘topping’ ingredients, bake, done. Mix the flour and the salt together, then add the yeast and water. If using a stand mixer, use the dough hook to knead for 5 minutes on a low speed. If mixing by hand then knead for at least ten minutes. Make a ball of the dough. When using a stand mixer, I just cover the bowl with clingfilm and leave to proof in a warm place for an hour. If doing by hand then flour a bowl and place the dough ball inside. Cover with clingfilm or a damp tea towel and leave to rise for an hour. Once the dough has risen, carefully tip it, using a dough spatula to gently pull it away from the sides of the bowl, onto a floured surface. Preheat the oven to 250c. Divide the dough equally into 8 balls. Flatten them into rounds using your hand. 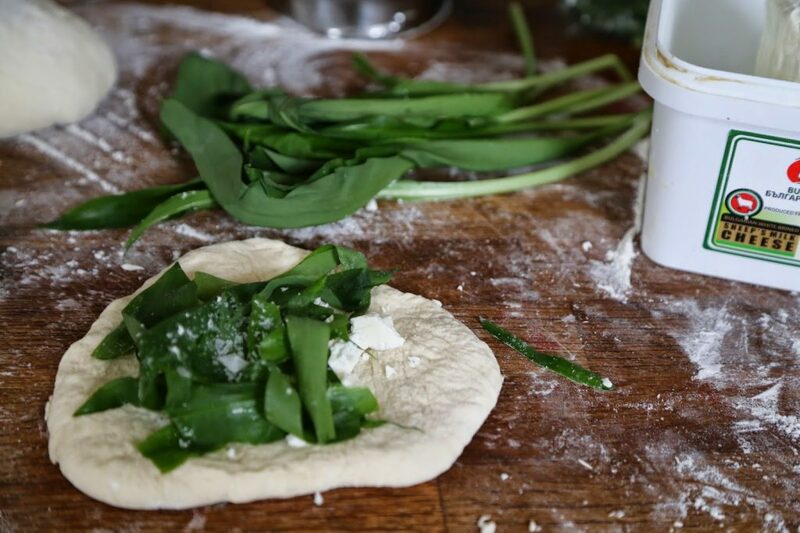 Then add some wild garlic leaves, (I stripped the leaves away from the central stalk), some sheeps cheese (you can use other cheeses) into the middle of the dough circle. I then crumbled a little sea salt on top. Lift the edges of the dough circle, gathering them up until the edges meet in the middle and press them together. Flip over the ball and flatten into a circle again. Do this with all 8 balls. Line them up on a silpat or parchment paper, with gaps between them. Place in the oven for ten minutes then flip them over and cook for another five minutes or so. They will puff up. Remove them from the oven and eat while warm. 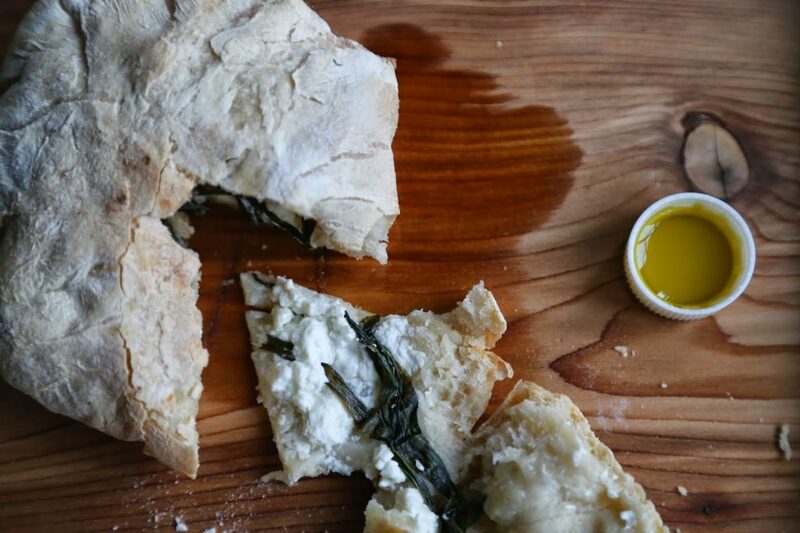 Once broken open, drizzle with olive oil. If you want to freeze them, part bake them for only 8 minutes, remove, leave to cool then place in a plastic bag and freeze. I love ramps/wild garlic. They grow wild in our garden in Provence. You can basically eat the whole thing. Just break off the very tops and you're done. I usually wait until after rain, as then they are easier to pull out. Will try this recipe tonight – thank you. I hope you enjoy the recipe, I've got another wild garlic one coming up later this week. Let me know how it goes? WOW!! !, THIS IS GORGEOUS! !, I love it. They were very good to eat! Wooo! My husband will go mad for this and won't greet dinner with 'not more effing wild garlic!' THANKS!